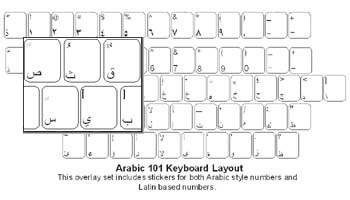 Arabic keyboard labels are a high-quality, durable and inexpensive solution for converting your keyboard into an Arabic (101) keyboard layout. These labels are available in white letters on black, opaque labels. Arabic (101) - White letters on black, opaque labels. Our labels are printed sub-surface on clear Lexan® so the original key legend shows through. This allows you to add the labels to your existing keyboard so that it becomes a bilingual keyboard. The labels use an easy peel and stick application and can be removed if needed without damaging the keys. The Arabic (101) labels support the Arabic keyboard layout in Bahrain, Egypt, Iraq, Jordan, Kuwait, Lebanon,Libya, Oman, Qatar, Saudi Arabia, Syria, U.A.E., and Yemen.The label set includes two sets of number labels so you can elect to use Latin style numbers or Arabic language style numbers. This language is supported in Windows XP, Windows Vista and Windows 7; older versions of Windows will require an Input Method Editor (IME)from Microsoft or third-party software. We also have the Arabic (102)keyboard labels that support Arabic in Algeria, Morocco,and Tunisia. The DataCal Arabic label set includes both Arabic style and Latin style number labels. You can choose which style you wish to use. Because Arabic text entry is right-to-left, certain characters, such as the parentheses, brackets, braces,etc. are on different keys in different software applications. The DataCal Arabic keyboard label set includes labels for both configurations.